U.S. Budget Disaster Strikes – March Outlays 2.5 Times Income!! Yes we had two more banks fail today… one the FDIC could not sell and simply told depositors to take their money and move it to other banks. The reality, of course, is that the FDIC does not actually possess any money to guarantee anything. All of that money must be fabricated. But bank failures are NOTHING in comparison to what’s happening to our government’s budget. WASHINGTON (MarketWatch) -- The U.S. federal budget deficit rose to a record $956.8 billion in the first six months of the fiscal year after the government stepped up spending to cope with a recession that has depressed tax receipts, the Treasury Department reported Friday. The deficit is well on its way to the $1.75 trillion -- or 12.3% of gross domestic product -- that the White House has estimated for the full fiscal year, which ends in September. The deficit through the first six months is more than three times higher than it was at this time last year. The government has borrowed $1 trillion from the public so far this fiscal year. In March, the deficit widened to $192.3 billion from $48.2 billion in March 2008. Outlays rose 41% to $321.2 billion from $227 billion, while receipts dropped 28% to $129 billion from $178.8 billion. Receipts from individual income taxes fell 27% in March, versus year-earlier figures. Individual refunds are up 14% so far this year. 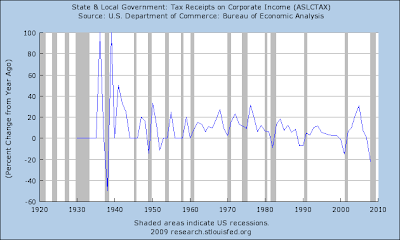 Compared with a year earlier, corporate income tax receipts fell 90% to $3.4 billion. Much of the increase in outlays in March came from extraordinary investments by the government in banks and Fannie Mae and Freddie Mac, loans to credit unions, and increased spending from the stimulus package for unemployment insurance and Medicaid. Some of those investments should be repaid over time, but the government is booking them as cash expenses for now. In March, Fannie Mae received $15.2 billion, Freddie Mac received $30.8 billion, and unemployment benefits totaled $10.6 billion. Through the first six months of the fiscal year, outlays are up 33% to $1.95 trillion. Receipts are down 14% to $989.8 billion. Corporate income taxes are down 57% to $56.2 billion, while individual income taxes are down 15% to $429.7 billion. Payroll taxes are up 0.3% to $430 billion. This is truly an EPIC collapse of government receipts, and maybe one of the most important stories of this time. Failing banks are one thing, failing governments are another. 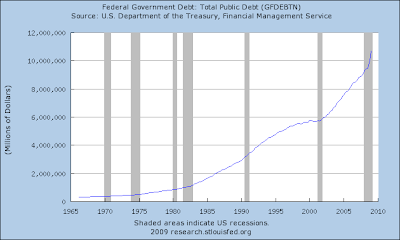 Remember, deficit spending leads to debt. The only way to service debt is with income. Thus, in the long run what matters is debt to income. But if you really want to create a crisis in the here and now, the best way to do it is to run out of cash! How does one do that? Simply by taking in less cash than you pay out. Right now we’re talking about outflows that are 2.5 TIMES income for the U.S. Government! Forget about GDP comparisons, they are meaningless. 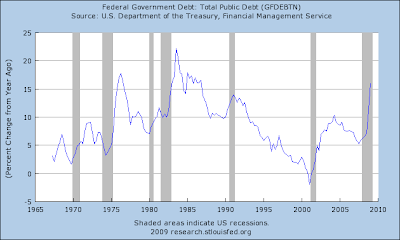 We simply are piling debt on top of debt and we do not have the cash to pay our current bills much less those of the past. And none of our government’s budgets use the same GAAP accounting rules that they mandate you and your company use, they do not count future obligations as deficits – thus the term “CURRENT account deficit.” Check the BIG RED NUMBERS at the bottom of this blog. That number is VASTLY understated. Heck, they won’t even dream of adding Fannie Mae and Freddie Mac debt to their own balance sheet – I mean OUR own balance sheet – because the amount of debt is staggering. For the last several years our total national receipts were running at about $2.7 trillion per year. March’s receipts annualized add up to only $1.5 trillion. 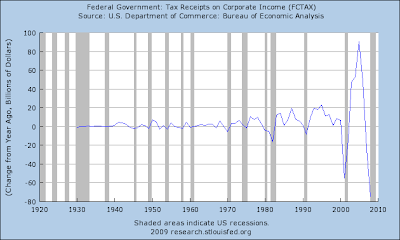 CORPORATE INCOME TAX RECEIPTS DOWN 90%!! That is EPIC! Is this happening only on the National level? NO! It’s happening on all government levels from the city, to the county, to the state. Revenues crashing, expenses skyrocketing… Here in Washington State, our budget deficit is now climbing at the rate of half a billion dollars per month! I just read an article that said one of the local towns is closing several main arterials to truck traffic because they can’t afford to repair the roads (Auburn May Ban Trucks from Key Freight Routes)! Make no mistake. This is a collapse of HISTORIC proportions. Total receipts DOWN 28%! That in itself is unprecedented, but combined with a 41% rise in outlays is simply a DISASTER. Deficit spend yourself to prosperity? That takes a special brand of nuts – as in INSANE. Can you imagine the trouble you would be in if your expenses were 2.5 times your income this month? What would you do? 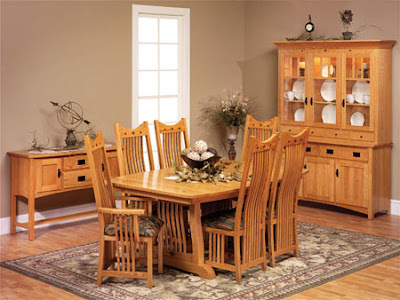 Would you spend more to stimulate your household? Where would you get the money? Borrow it? How long will that last? Uh, huh… that’s what I thought. Think we can print our way out of that? Forget it. Mayor Bloomberg is calling the city of New York bankrupt unless they get MAJOR concessions from employees on their pensions. That’s two problems in one. Pensions are another very major problem, and all these problems compound upon the same 305 million taxpayers, many of whom are now unemployed, semi-employed, or whose living wage has been exported. People who believe that municipal bonds and U.S. Treasuries are rock-solid safe because they have the power of taxation had better look at the numbers above. And those who believe that the government can spend our way out in New Deal fashion are simply math challenged. We cannot afford to maintain the infrastructure we have, much less build more. This is what happens when private central bankers run your money, your politicians, and your country. They create a monetary system that requires never ending growth to remain functional while they skim the growth and pocket your production along the way. Over time they hold all the wealth. Never ending growth is simply not possible as those who have spent some Time with the Good Dr. Bartlett know. This historic drop in revenue is no surprise to me. The math underlying our economy does not work and is getting worse. I wrote Death by Numbers only a few months ago. The math is getting much worse, the same 305 million people are obligated for it all – that includes us and our families.